Upon reaching the end of the pitch, the leader establishes an anchor as a new belay station (fig. 11-27). Place this anchor, when possible, to the side of the route (especially if you are sack hauling) so that your second can easily climb through. Also try to place at least one aid piece at the start of the next pitch to give the second a stance while changing leads. When establishing your anchor, make sure all anchor points (including the haul anchor) are connected to all other anchor points. If an existing anchor system is in place do not simply place a sling over the system. This is an easy mistake to make and experienced climbers have paid for this error with their lives. Clip in, instead, in such a way that should any portion of the anchor fail, your attachment won't slide off the failed end. Similarly, complete anchor systems have failed when a separate haul anchor, which was not interconnected with the main anchor, failed. In these cases the force generated by the falling haul sack overloaded the main anchor. Fig. 11-27. 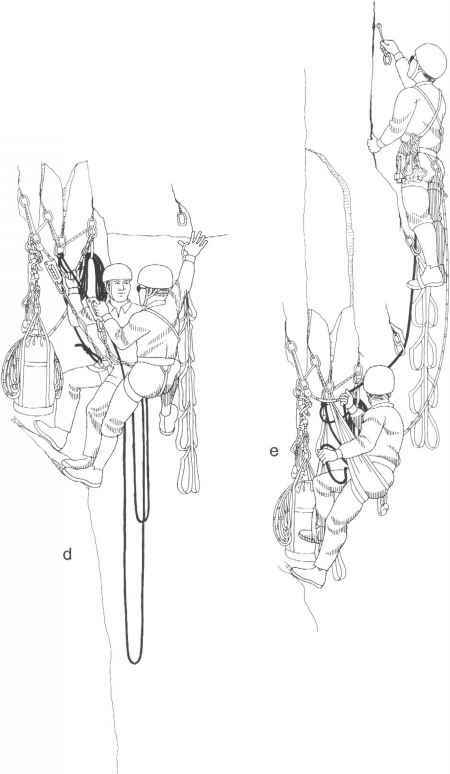 Hanging-belay sequence: a, leader establishes anchor; b, with climbing rope anchored and the haul system set, the second frees the haul sack (note that the first piece of the next pitch is set); c, while the second ''jugs," the leader hauls the sack; d, the haul sack is anchored, and the second moves onto the first piece of the next pitch; e, after re-racking, the new leader begins to lead. rope so that the second can ascend it as a fixed line. Now prepare the hauling system, if you are hauling. Remove the aid rack and use it as the counterweight for the hauling system. Inform the second to free the haul sack so that you can hoist it while the second ascends the fixed climbing rope. 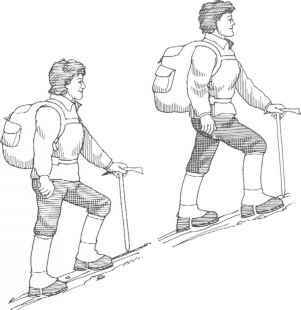 After the hauling is completed (or after the climbing rope was fixed if you are not hauling), establish your belay seat, get comfortable, and prepare for the exchange of leads. Sort the rack, organize the ropes, prepare your belay system, and so forth.